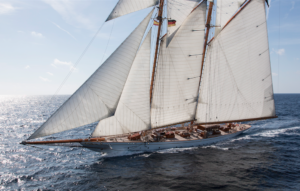 Some of the world’s most famous vintage yachts will be exhibiting for the first time at The Palma Superyacht Show (27th April – 1st May 2018). Increasingly classic yachts are choosing Palma as their base. Their presence at this MYBA show is a significant one. Here is a run down of the classic yachts to look out for at the show and who to call when you are ready to join this classy club. In 1936 Sir Arthur Young, one of Scotland’s leading yachtsmen, commissioned the legendary Alfred Mylne to design Thendara. Built and launched the following year by the Clydeside yard of Alexander Stephen & Sons, she was an immediate success on the racing circuit, and went on to provide her owner and guests with many pleasurable years of cruising. After Sir Young’s death in the summer of 1949, Thendara was sold and disappeared to Greece, and later Italy, where she slipped into decline. In 1993, a new owner commissioned Southampton Yacht Services to ship her from Italy to England where a full refit was carried out. This restoration has seen her sail into the new century as a truly elegant example of living history. 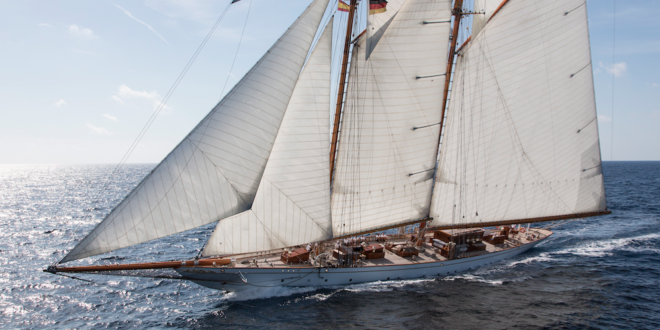 One of the most recent J-Class reproductions on the market, Rainbow is a best in breed yacht developed from the original plans of the 1937 America’s cup winner of the same name. Naval Architects Dykstra & Partners optimised Rainbow’s performance through lightweight construction. North Sails 3 Di racing sails and Lewmar winches are customised to her specific requirements. Rainbow was designed to replicate the iconic original, upgraded with cutting edge technology. The yacht was built to meet The J-Class Association Maximum Performance Rules. 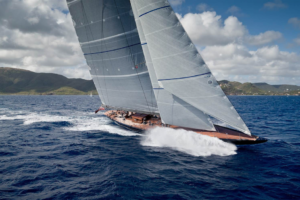 Rainbow has been successful in Superyacht regattas in The Mediterranean and The Caribbean. This is a yacht that is truly Race Ready! Shenandoah of Sark incorporates cutting-edge design, craftsmanship and elegance. She was built for speed and long-distance ocean sailing. 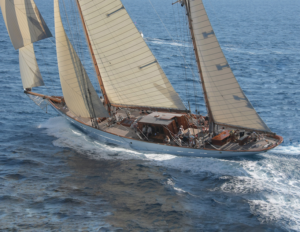 She is one of the most famous of the classic yachts afloat today. In immaculate condition and technically up-to-date, Shenandoah has cruised in the world’s remotest areas, often under extreme conditions. 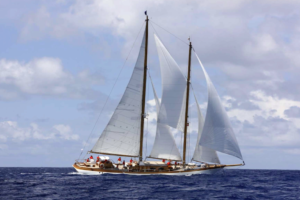 This three masted gaff topsail Schooner is a yachtsman’s sailing yacht. She is easy to handle, smooth and responsive, truly coming into her own in stiff winds and whitecaps. She is a piece of maritime history. 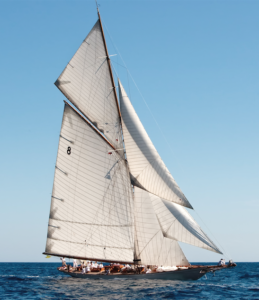 A Spirit of Tradition yacht, Emmaline is a modern interpretation of the Bristol Channel pilot cutter. Traditional wood joinery is combined with immaculate brightwork. Her plumb bow and broad counter stern make her an imposing presence on the water. Emmaline was built for serious off the path exploration and comfortable cruising. 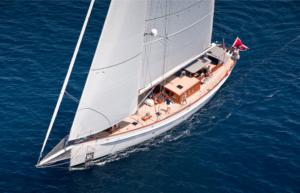 She features a powerful sail plan, is configured for genuine short handed sailing and minimum crew. A lifting keel allows Emmaline to enter shallow bays unreachable by other yachts. She is fully licensed for charter. Seljm was built in the renowned Italian yard Sangermani. The yacht has benefited from the same ownership for the last 18 years and has been generously funded for safety, upgrades and maintenance. Seljm has been lovingly maintained to the highest standards over the years. She has always been classed Lloyd´s 100 + A1 LMC. She offers accommodation for eight guests in four staterooms. 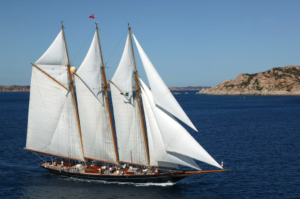 Germania Nova is a replica of the famous 1908 schooner Germania. She was designed using identical hull lines as well as the same sail and deck plans. The attention to detail runs across this magnificent yacht, which all devoutly follow the original design. Her classic style is balanced with the latest engineering and systems. Germania Nova has both the charm and nostalgia of the Edwardian Era, allied to the comfort and high performance standards of the original Germania. She carries MCA LY2 designation. Germania Nova’s interior offers a bright and spacious layout. She provides guests the opportunity to experience a gentle, relaxing sail or by contrast; an exhilarating experience at sea. This yacht has proven sea-keeping ability, with over ten Atlantic crossings since build. Moonbeam IV below is available for charter for those of you who want to try before you buy. The story of the Moonbeams began in 1858 with Moonbeam I & II. Moonbeam III was launched in 1903. This fourth, final and largest Moonbeam IV was designed and built by William Fife Junior in Scotland for Charles Plumptre Johnson, the son of the physician to Queen Victoria. She was first launched in 1914 and commissioned after the Great War in 1920. Moonbeam IV is a regular on the Mediterranean classic yacht racing circuit and regularly takes podium. Available for regatta charters and charters through Captain Mikael Creach creach.mick@gmail.com. DON’T MISS A BEAT OR A BULLETIN! Are you RACE READY? Check out the global yachting season and download my FREE International Regatta Calendar 2018/19 for Vintage, Classic and Modern Classic Yachts. Now you can download your dates straight to I-Cal. www.alicewiddows.com.